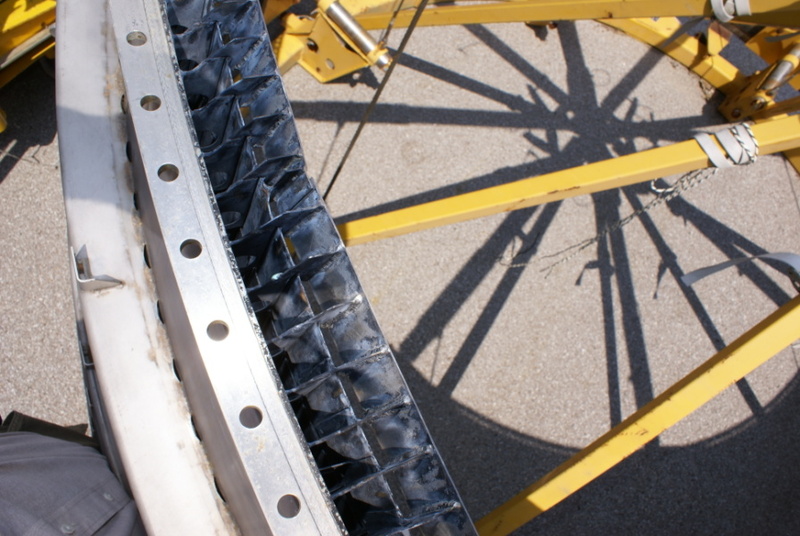 View of the top of the nozzle extension. The nozzle extension is double-walled, with cooler turbine exhaust gasses (cooler in comparison to the main exhaust) entering here. The inner wall is constructed of 23 rows of overlapping shingles. The turbine exhaust gasses vent through gaps in the shingles, film-cooling the wall of the extension. If you look carefully, you can see through the gaps between the first and second rows of shingles. F-1 engine F-041 at the Air Zoo offers a view of the F-1 engine proper, the transition to the nozzle extension, and the full inner wall of shingles. I have a series of photos of F-1 engine F-114-2 at Stafford Air & Space which features a view into the top row. F-1 engine F-6045 is displayed at the U.S. Space and Rocket Center without a nozzle extension, allowing a view of the turbine exhaust manifold (which feeds into the nozzle extension). The nozzle extension bolts to the engine via the holes in the silver flange. These photos were taken by holding the camera over my head, "shooting blind." Shadows of my arms and the camera are visible on the nozzle extension.